If you have damaged or weakened teeth, dental crowns placed at Dr. Michael Appleton's Slidell practice can restore your smile and dental function. Dental crowns are tooth-shaped caps that are placed on top of compromised teeth to provide support. They can also be used in conjunction with a dental implant to replace a single missing tooth. Crowns can be made from a variety of durable and lifelike materials to suit your preferences and needs. For the ultimate in patient convenience, we are proud to also offer same-day crowns, allowing you to complete your entire restorative procedure in one office visit. Contact Oak Harbor Family Dentistry today to learn more about our crowns and how they can enhance your smile. We offer same-day crowns at Oak Harbor Family Dentistry in Slidell, LA, to help our patients restore their smiles as soon as possible. 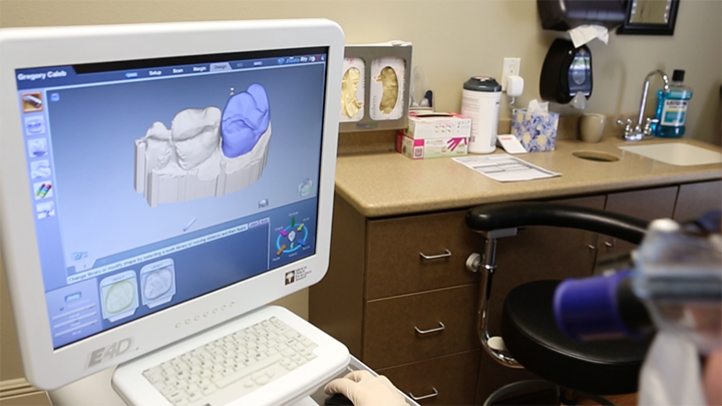 Using CAD/CAM technology, we can fabricate your custom restoration in our office while you wait. We also offer traditional crowns, which can be made from full metal or porcelain fused to metal. Once the decayed or damaged portion of a tooth has been removed, the remaining healthy structure will be reshaped into a strong base for the crown. Impressions will then be taken of the tooth, which will be sent to a lab where technicians will fabricate your restoration. If you select a traditional lab-created crown, the dentist may supply a temporary crown while you wait for your permanent restoration, which will take about two weeks to make. When the permanent restoration is finished, Dr. Appleton or Dr. Braud will check the fit, making sure that the crown does not interfere with your bite. After making any necessary adjustments, the crown will be attached with dental cement. Oak Harbor Family Dentistry can also provide same-day crowns. Using the state-of-the-art E4D system, Dr. Appleton or Dr. Braud will take digital images of your prepared tooth, which are transmitted to a computer that creates a three-dimensional map of your tooth. The computer will then transfer the map to an in-office milling machine that will fabricate a new, entirely individualized crown from a single block of porcelain. The procedure takes less than an hour, and the results are outstanding in function and fit. Dr. Appleton can help you decide if this expedited option is right for you. All-porcelain: All-porcelain crowns come in a variety of realistic tooth shades. IPS e.max®: Made of lithium disilicate, these crowns offer the lifelike appearance of all-porcelain crowns and the durability of metal. Zirconia: This advanced type of porcelain is considered the strongest and most natural-looking restorative material. Gold: Gold crowns are extremely strong and durable, and have an extremely low allergic risk. Porcelain-fused-to-metal (PFM): These crowns have a metal core and porcelain exterior for strength as well as function. Are You a Candidate for Crowns? If you are suffering with a compromised tooth, contact us today to find out how a dental crown can restore your smile.